Mike Kryzewski and Johnny Dawkins did not look like two opposing coaches when they met each other at the scorers' table this past Sunday. It looked more like a father and son greeting each other after a long absence. 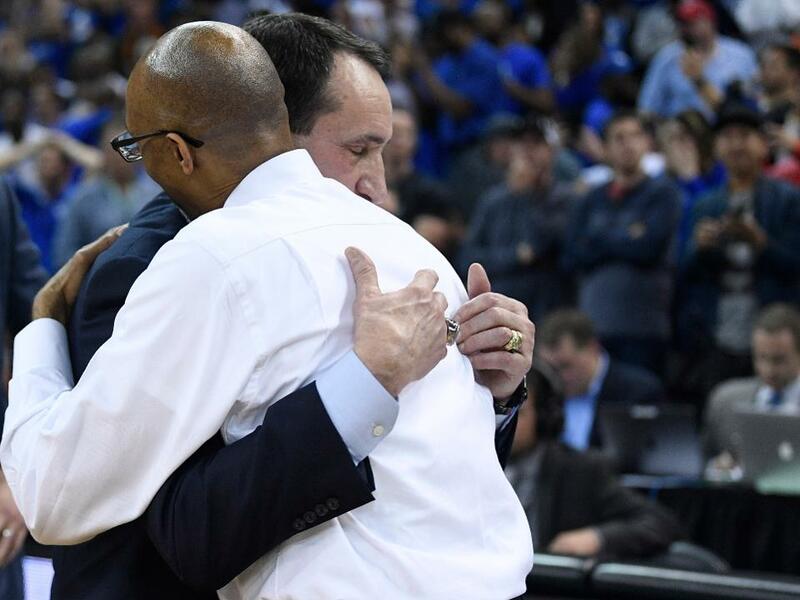 The affection these two coaches have for each other was unmistakable and refreshing. Soon after the embrace, Kryzewski’s Duke basketball team played Johnny Dawkins’ University of Central Florida squad in an epic NCAA battle. A game, which once again, saw Duke pull out a miracle as they always seem to do. In the last 36 years, the Duke basketball team has only had one losing season. It was the year Coach K got sick and took a leave of absence. 36 years of winning overshadow the coach's early failures at Duke. When Duke hired Mike Kryzewski, he inherited a program that went 24-9 and finished ranked #14 in the nation. However, under Coach K’s leadership, the team's performance declined in each of his first three seasons. After his third year, a season which ended with an 11-17 record, the Duke athletic director was seriously contemplating firing the young coach. Fans would have supported the move. There was one thing standing in the way of sealing the coach’s fate. A young freshman named, Johnny Dawkins. During that 11-17 season, Dawkins averaged 18 points a game and was clearly a standout. He was joined by three other freshman stars — Jay Bilas, Mark Alaire and Dave Henderson. By the time these four players were seniors, the Duke basketball team was 37-3 and lost in the NCAA National Final game. Years ago, I wrote an article about Mike Kryzewski’s first three years at Duke. In the article, I wrote, “In the past 25 years our appreciation for growing into something has been replaced by a pressing concern for immediate success. Our emphasis on immediate success has become a demand for perfection.” Today, we expect perfection, demand perfection and will not be satisfied with anything, but perfection. This approach to life is not limited to sports. It filters down into people’s expectation of elected officials, doctors, and even pastors. Some parents even expect perfection out of their children. Faith works with a different ethic. We know from infancy through adulthood, people have losing streaks. At the same time, we also know love has a way of creating beauty in the midst of losing. Happy are those whose transgression is forgiven. Eugene Peterson's translation of this verse is more fitting to UCF coach, Johnny Dawkins. Peterson wrote, “How happy you must be—you get a fresh start, your slate’s wiped clean.” Before taking the job at UCF, Dawkins was fired at Stanford after several good years. UCF was his fresh start and a new beginning. At the end of the game, the two friends embraced once again. Their second embrace was even more emotional than their first. They had battled in a world where one wins, and one loses. But their love for each other transcended this definition. These two coaches know “happy are those who transgressions are forgiven” and forgotten. How often do you feel perfection is expected of you? When is that expectation of perfection self-inflicted? How forgiveness free you to fail? How can failing lead to success?